I love Nile. When I found out I had the interview, I was elated, and a bit nervous. I had seen a Reddit interview Karl Sanders of Nile did with his fans, and the opening description said something like, “I want to do this with my fans, I’m tired of the same old journalist questions.” So…I knew this interview had to be good. I arrived at the venue and hit up the tour manager as instructed. It was a hot day, and I was in black slacks and luckily had found a metal t-shirt in the back of my car. The time was arranged, and I waited by the bus. And waited. 20 minutes later, horoughly drenched in sweat and wondering what went wrong, the tour manager came out and realized he hadn’t received the text with his international sim card, or something like that. He said, “Come get on the bus, it’s too hot out here, and I’ll go find Karl.” I sat on the bench seat where he offered a place for me to sit, and directly across from me was George Kollias. The tour manager introduced us, and I giggled inside, because, well, duh, I knew who he was. While the tour manager rounded up Karl, I had a nice impromptu 10-minute chat with Mr. Kollias, discussing Portland, South Africa, coffee, tour life, and the weather. Soon Karl entered the bus and he and I took a stroll to the back of the bus. Twenty minutes passed like talking to an old friend, and I wrapped up the interview, thanking him for his time. He stopped me and said, “You didn’t ask me four of the question on your notes.” “Do you want to continue?” I said. “Yes, go!” he said, and I did. I missed the first band completely due to the timing of my interview with Nile, but I arrived just in time to catch the end of the last song from my friend Chuck’s Native band Damage Overdose. And I was finally able to catch his other band, Season of Suffering for the first time, as they were the last local before Nile. Not only does my friend Chuck have exquisite taste in music, but he is an incredible guitarist and front man. Season of Suffering was the perfect band to get the crowd ready for Nile and Soulfly. Melodic, groove-oriented, and heavy. Finding my way to the front row, stage right, my positioning was right in front of Karl, just like it is every year. Nile’s music is heavy and complex. Yet, it has a sensuality to it that is hard to explain. Much like Ted Nugent’s “Stranglehold,” or many Morbid Angel songs, the heaviness, mixed wit the pace and rhythm is something primal, that feels sensual. Nile has never disappointed me, and I will never stop seeing them live or collecting their catalogue of music. While we saw Max Cavalera briefly at the end of Nile’s set, seeing him with his Soulfly is always a pleasure. It’s like when your favorite Uncle comes to town and takes you to really fun places and let’s you do things your parents won’t let you do! 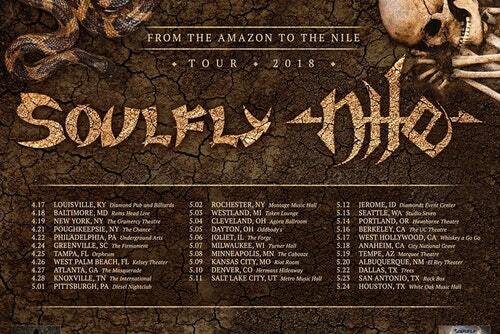 While the tour was co-headlined by Nile and Soulfly, on this night it was Soulfly who had the headlining spot. While we’ve seen Max a lot lately in Portland with Soulfly, Max and Igor, and Cavalera Conspiracy, it is always a packed house and a happy occasion. I don’t think it would matter who opened for who, because both bands share the same intensity. The energy, authenticity, intensity, and sincerity that is Soulfly, largely because of Max’s insatiable love of music, made this night very special (but it is always very special when he is in town). While it was hot by virtue of the sweltering day’s temperature, had it been snowing and December, we’d all still have been drenched in sweat. The bounce, groove, and drums of Soulfly bring out a comradery between fans that is rarely seen. When Max steps on stage, he commands, without trying, the dedication and following of every single person in the room. If he asks for raised fists, he gets it. He asks for chants, he gets it. He could ask for everyone to stand on one foot and bark, and we’d do it with pleasure. Whatever magic Max was born with creates an environment where we gather close together without irritation and collectively move as one. While the pit looks brutal at times, it is really a happy dance spawned out of appreciation for everything Max gives us.